A few months ago I asked people on my facebook author page what they would like to see me blog about. Most people answered that they would enjoy reading about the trials and tribs of teaching in the public school system and whatever tips I could offer on being a writer. I’ve enjoyed blogging about those because I think my experience can be a resource to others. Surprisingly, a few people also answered that they would like to understand how I can see the world through a mathematical lens. Today’s blog post is for them. So, allow me to set the stage. I love math. I think it’s cool, but not so much in the theoretical, abstract, and nerdy way that I love ScienceFiction/Fantasy. This might be surprising because I struggle with details and the execution of math is in many cases a very detail-oriented pursuit. However, if you’re trying to cut through the political noise of some talking-head and get to the point, math does the job better than anything else. In that sense math is like the cleaver in the butcher shop. What’s even better about this is that you can do this with a decent grasp of high school math. In fact, I’m not going to use anything that a decent student in Algebra 1 or 2 couldn’t understand. I can tell you that nothing engages the teenage mind, however temporarily, like the thought that someone might be taking advantage of them. Then, I ruined their day. I told them. The graph you see shows two curves. 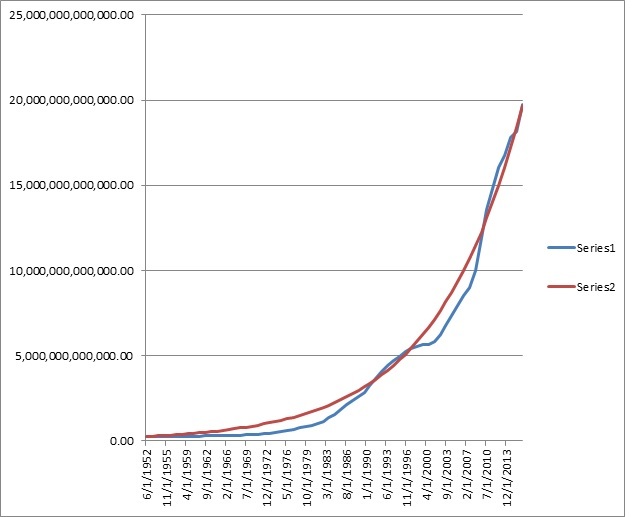 The blue curve is the actual data on the size of our government debt taken from the U.S. Treasury website. It wiggles and waggles, but right now, we’re within spitting distance of 20 trillion dollars. The webpage I found only went back to 1952, but I thought over 60 years-worth of data would be accurate. Then they asked about the red line, and that’s where things got really interesting. 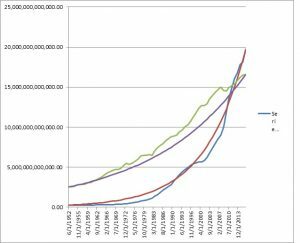 The red line was my attempt to curve-fit the data to a simple exponential growth formula, the same kind you suffer under if you don’t pay your credit card off each month. 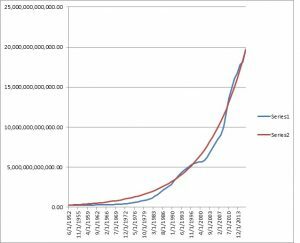 To get the red line, I simply calculated how much, by percentage, the debt grew each year according the U.S. Treasury. Then I averaged all of those and used that as the growth factor in an exponential equation. Here’s where this gets more than a little passing strange. The figure came out to be almost exactly 7%. Almost exactly 7% over the course of 60 plus years. In fact, to get the curve fit to be any more accurate, I had to go out three more decimal places to 7.001%. That was almost weird enough to turn me into a conspiracy theorist. Why? Because 7% follows the “rule of sevens” that you read about in accounting. Here’s how it goes: If you have an investment (or debt) that compounds at ten percent, it will double in value every seven years. Conversely, if the rate is 7%, it will double every ten years. To which I said, “Let me think about that.” After all, it was a very good point. So then, I thought. Maybe she’s right. Maybe all my histrionics about debt are meaningless since everybody using the same deflated currency anyway. So, I went back to the U.S. Treasury website and looked for more data. This time I pulled out the numbers for the size of the U.S. Economy, the big kahuna, the Gross Domestic Product. In other words, the dollar figure attached to THE ENTIRE PORDUCTION OF THE WHOLE U.S. ECONOMY! And I ran the same analysis on the economy that I did the debt and put it on the same graph. 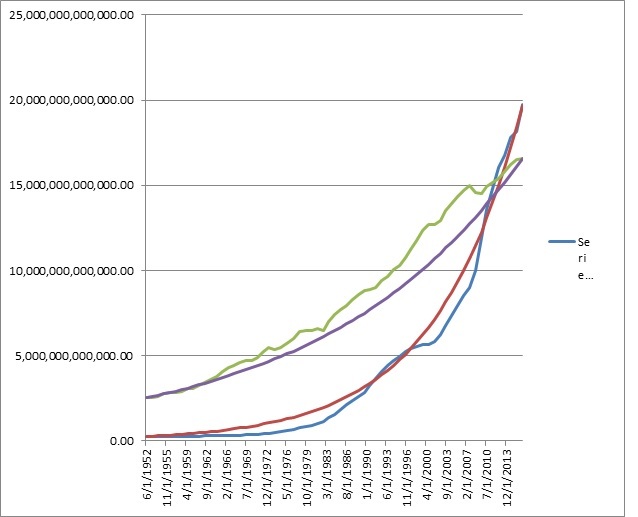 The green line is our economy, also in trillions of dollars and the purple line is the curve fit. In numerical terms, the economy is growing at about 3% per year. For decades, our strong economy and our low levels of debt have provided the economic cushion for our country to thrive. See that point in the upper right corner where all the curves mash up against each other? That was our tipping point. That’s when our debt became bigger than our entire economy. We’re now in a situation where it’s going to be really hard to fix this. Our debt is accelerating away from our economy with a growth rate that’s more than double (7% vs. 3%). In dollar terms our debt will be 42 trillion while our economy will be 23 trillion. That’s only ten years from now if our government doesn’t get this under control. I don’t even want to think about what the end-game of this looks like, but I’ve got some writer friends that could whip out a great dystopian novel for you with this little gem as the premise. Honestly? I was kind of hoping I would die of old age before that train wreck. I don’t think that’s going to happen anymore. Now, if you accept that my figures are honest (I’m very sorry to tell you that they are) and that my analysis is reasonable (sorry again), you’re probably wondering what you’re supposed to do with this. That will be the subject for a later post, but I can tell you that the first and most important thing you should do is stay calm. Countries have completely collapsed from debt any number of times through history. As a man of faith, I believe God has a plan. I’m on a need-to-know basis, and most of the time I don’t know, but that’s okay. As the saying goes, He’s God and I’m not.